A healthy, beneficial, and fun pastime to pick on the Central Coast is yoga. Through breathing, stretching, and challenging your body, you can achieve new levels of relaxation and flexibility that will leave you feeling centered and happy! The effects of yoga are comprehensive and benefit all of you: body, mind & soul. Yoga isn’t a new fad, but has been practiced for thousands of years, and the benefits have long since been proved. However, don’t be intimidated if you’ve never tried before. Yoga is a personal venture, so each person’s practice will look a little different; you’re trying to improve yourself, rather than compare yourself to others. Thankfully, on the Central Coast we have classes and festivals tailored to all levels of yoga, even if you’re 100% a beginner, so there’s no excuse not to try today! For yoga studios on the Central Coast, you can take your pick between studios that solely focus on yoga, or ones that offer other various exercise classes to spice up a workout. SLO Yoga Center is $10 for your first class, and offers a variety of classes. In addition to over 70 classes a week in the studio, they also host Stand-Up Paddleboarding (SUP) yoga in Morro Bay, where you’ll do your chaturangas while floating on the water! 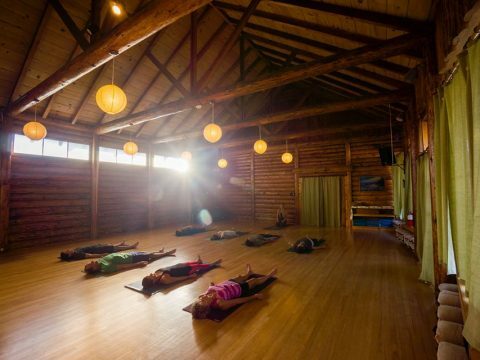 There are many other options for yoga on the Central Coast – this is just one of the many thriving studios. In San Luis Obispo, a new yogi could also try Spark Yoga (first visit is free, and every class is heated to some degree), or head to Harmony House Yoga in Pismo Beach. As our community really loves and has embraced the yoga lifestyle, many of us are coming together this weekend during the Avila Beach Yoga & Art Festival. All ages and all levels are welcome to this exciting event, encompassing yoga, art, food, music and more. Deepen your practice with over 35 yoga-inspired classes, learn technical details about alignment in specific workshops, or simply relax in meditation and enjoy great food. The event closes out with musical performances from FRENSHIP, Rozes, and Goldboot. The festival isn’t just for yoga “experts,” but for anyone who could benefit from yoga in their life or who appreciates good food, health, and connection with others. Don’t miss it weekend, July 9th, at the Avila Bay Club across the street from Avila Lighthouse Suites. The important connection between one’s surroundings and one’s comfort is not lost on us – which is why it makes sense to practice yoga only in the most beautiful or relaxing of locations. Why settle for anything less when it’s your own body you are working on? Some of the best yoga experiences are in nature, where you can feel a connection between yourself and the natural world. 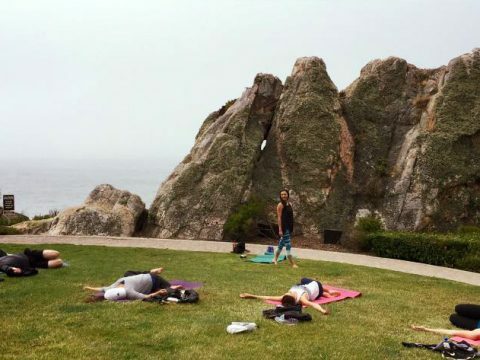 We can offer this for you with Inn at the Cove’s yoga classes, which are held right out on the lawn outside the hotel, overlooking our scenic coastal bluffs. Students breathe and stretch to the rhythm of the ocean, while inhaling fresh sea air. The unique location guarantees a special experience for advanced students, but the classes are also designed with simple postures to accommodate beginners. Whatever your skill level, you won’t want to miss a great yoga class at Inn at the Cove. Classes are taught by Yoga With Lindsay on Tuesday and Thursday from 9-10 am and Saturdays from 10-11 am – and it’s only $10!